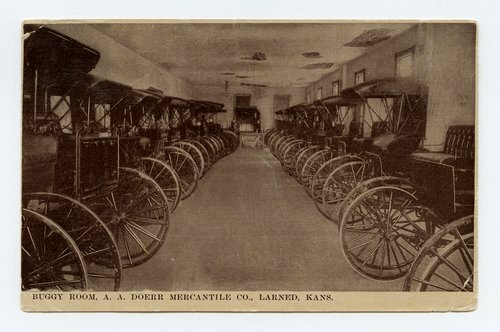 Thirteen stereographs and one postcard showing exterior and interior views of the Albert A. Doerr Mercantile Company located in Larned, Kansas. The Doeerr's Big Store was a combination general/department store selling furniture, hardware, clothing and bedding, buggies, harnesses, and farm implements. It even had an undertaking department with caskets.